What is the 'floor life' for the different moisture sensitivity levels? The Moisture Sensitivity Level (MSL) indicates the floor life of the component, its storage conditions, and handling precautions after the original container has been opened. The permissible time (from opening the moisture barrier bag until the final soldering process) that a component can remain outside the moisture barrier bag is a measure of the sensitivity of the component to ambient humidity. In many cases, moisture absorption leads to moisture concentrations in the component that are high enough to damage the package during the reflow process. The expansion of trapped moisture can result in interfacial separation, known as delamination, of the mold compound from the die or lead-frame, wire bond damage, die damage, and internal cracks. In the most severe cases, the component will bulge and pop, which is know n as the 'popcorn' effect. Therefore, it is necessary to dry moisture-sensitive components, seal them in a moisture barrier antistatic bag (with a desiccant pack and a moisture indicator card), which is then vacuum sealed according to J-STD-033 - see link below. Only remove the moisture-sensitive components immediately prior to assembly onto the PCB. The table below presents the MSL definitions per IPC/JEDEC's standard. Also refer to the “Moisture Sensitivity Caution Label” on the packing material, which contains information about the moisture sensitivity level of Freescale products. Components must be mounted and reflowed within the allowable period of time (floor life out of the bag), and the maximum reflow temperature does not be exceeded during board assembly at the customer’s facility. If moisture-sensitive components have been exposed to ambient air for longer than the specified time according to their MSL rating, or if the humidity indicator card indicates too much moisture after opening a Moisture Barrier Bag (MBB), then the components are required to be baked prior to the assembly process. To determine allowable maximum temperature, see the imprints/labels on the respective packing. 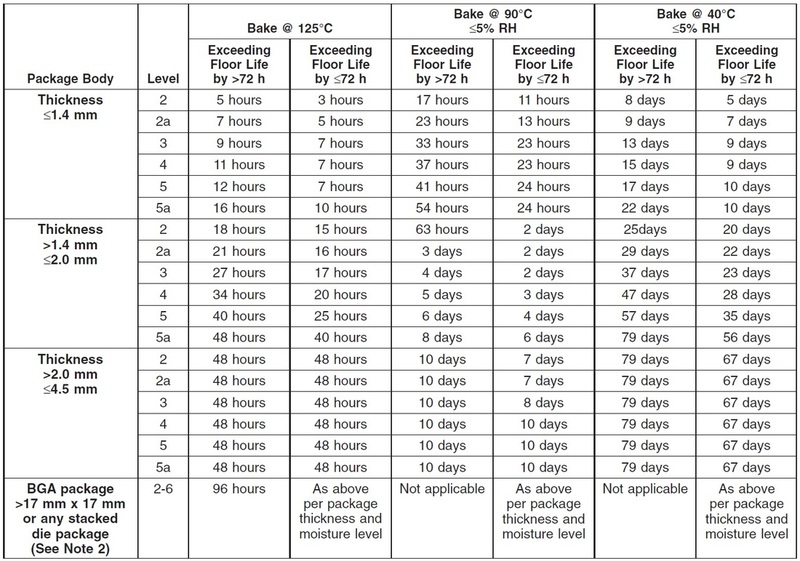 Below is a table indicating recommended pre-baking times.